Although you’re here to relax and unwind you won’t want to miss out on the things to see and do in the area. You will find a volleyball / badminton net and a couple of sets of horseshoe pits. Near the volleyball net there is a grassy clearing where you can toss a frisbee or football, or play soccer or other games. There’s a couple of kilometers of nature trails to explore too. The trails here at the Retreat are a delight for both bird watcher's and nature enthusiast's. In a forest of birch, poplar and spruce, the trails meander through a wooded valley that runs through the property. 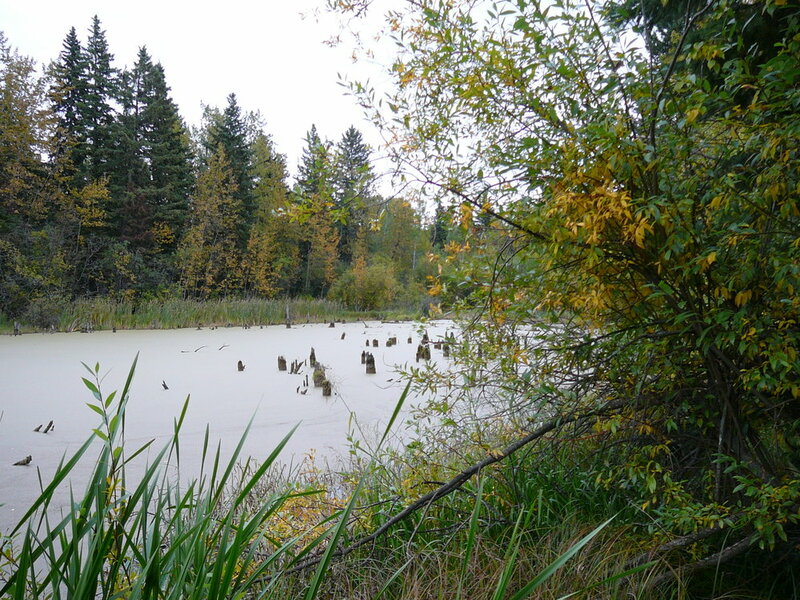 The "Lake Slough-ise" trail passes by a pond. Here you will often see ducks and frogs and occasionally, beavers or muskrats. Bannock with Jam and Mint tea: $8.00 per person - Enjoy bannock with jam and a cup of Mint tea served right at your site. You can have it baked or cook it yourself over your campfire using willow sticks provided by us. There are many interesting things to see and do within a reasonable driving distance. Then, when you’ve had your fill of exploring, come on back to your site to relax by a campfire away from the crowds. The west gate of EINP is only 3 km from us. Take a day trip and go explore all there is to see and do. There’s miles of hiking trails. Keep your eyes open for Bison and other wildlife. There’s an interpretive center, canoeing at Astotin Lake, and much more. The Ukrainian Cultural Village is only a half hour drive from us. The Ukrainian Cultural Heritage Village is an open-air museum where costumed role-players recreate the life of early Ukrainian pioneers that settled in east central Alberta from 1892-1930. The City of Fort Saskatchewan is only 20 minutes west of us and has all your shopping needs. There are miles of beautiful walking / biking trails to explore. Be sure to check out the famed sheep that keep all the grass in the parks trimmed the environmentally friendly way. If history is your thing, a must see is the Fort Heritage Precinct. It is a replica of the original RCMP Fort and all the history surrounding the Fort on the North Saskatchewan. Very cool. The City of Edmonton has many things to see and do. Like the Edmonton Valley Zoo, Muttart Conservatory, John Janzen Nature Centre, City Arts Centre, Fort Edmonton Park and the John Walter Museum. Rent a Segway and tour the River Valley. Edmonton is nicknamed the “festival city”. You can take in one of the many festivals or visit West Edmonton Mall. The thing is we’re close enough for you to enjoy some city sites but then end your day with the natural attractions you’ll find here, like stars, and forest, and fresh air. Visit Jurassic Forest - It’s about a 45 minute drive from us. For the avid golfer, there are numerous golf courses in the area. The closest one is Elk Island National Park. We are 3 kilometers from the west gate of the park. Other golf courses include: Legends Golf and Country Club, Fox Run Golf Course, Northern Bear Golf Club, Fort In View Golf Course, Fort Sask. Golf and Curling Club.